Already one of our favorite compact crossovers, Mazda’s CX-5 gets a redesign for 2017 that – in virtually every measure – makes it a better choice than ever. “Virtually?” Well … yes. Because a few will bemoan the loss of a CD player (the current trend), and others will miss the previously available manual transmission, which was offered only on the base front-drive Sport. That means a 6-speed automatic is now standard, which contributes heavily to a price of entry that has jumped by nearly $2300 to $24,985 (including the $940 destination charge). In reality, however, that’s only about $500 more than the previous front-drive Sport with automatic, and the 2017 comes standard with more features. Furthermore, even a carryover vehicle would likely go up at least that much with the new model year. 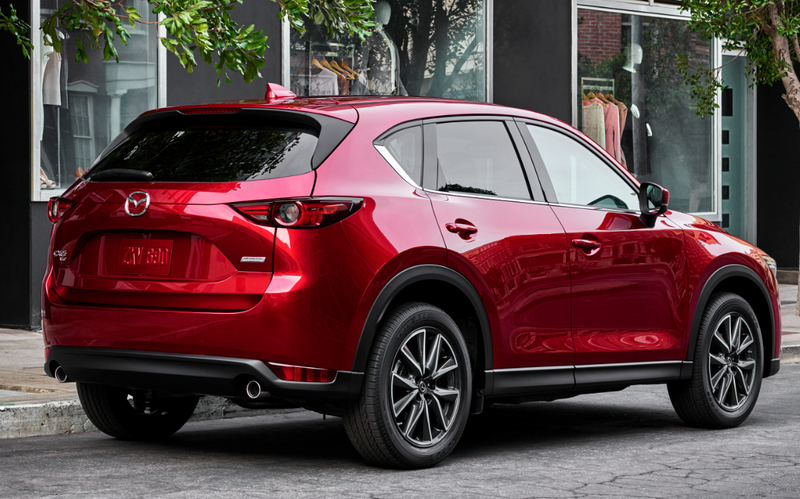 Although the new CX-5’s profile is similar to the outgoing model’s, the body-side lines differ. So does front and rear styling, the former (seen at top), closely resembling that of the larger CX-9. Shown is a top-line CX-5 Grand Touring wearing new-for-’17 Soul Red Crystal paint, a $595 option. Speaking of the new model year, the CX-5 is kind of late to the party. While most 2017s appeared last fall or even earlier, the CX-5 that has been gracing Mazda showrooms for the past several months was essentially a carryover of the previous-generation model branded as a “2016.5.” The all-new 2017 won’t be going on sale until later this month. When it does, buyers will notice a familiar silhouette, but with different body-side sculpturing and revised front and rear treatments. Mazda says there have been a number of changes aimed at stiffening the structure and improving sound deadening, and the interior has received a freshening as well. But more significant, perhaps, are the newly available features, which include a heated steering wheel, heated rear seats, a 2-postion reclining rear seat back, a power liftgate, windshield-wiper de-icer, full-speed adaptive cruise control (the previous system couldn’t bring the vehicle to a stop), and a head-up display. Once again, three trim levels will be offered: Sport, Touring, and Grand Touring. All come standard with front-wheel drive, but offer Mazda’s i-ACTIV all-wheel drive as a $1300 option. Newly standard on the well-equipped Sport is Mazda’s Smart City Brake Support, a low-speed forward collision warning and mitigation system that works at speeds from 2-19 mph. 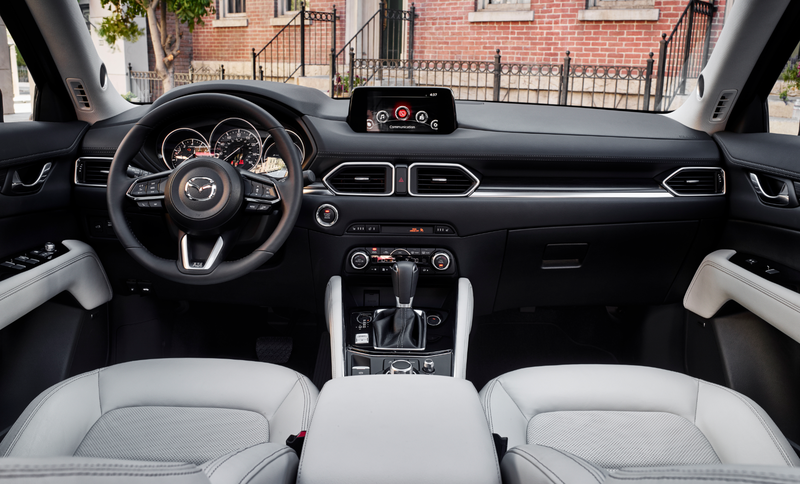 Also standard are a rearview camera, Mazda Connect infotainment system with 7-inch touchscreen and console control knob, LED headlights, and 17-inch alloy wheels. Touring ($26,855) adds such items as 6-way power driver seat, leather-like upholstery with pseudo-suede inserts, blind-spot and rear-cross-traffic alert, heated front seats, auto-leveling headlights, keyless access and starting, dual-zone climate control, and a reclining rear seat back. Optional at $780 is a Preferred Equipment Package that adds a Bose audio system, moonroof, power liftgate, navigation system, rain-sensing wipers, auto-dimming mirrors, Homelink garage-door opener, and automatic on/off headlights. Or buyers can opt for the $625 i-ACTIVSENSE Package, which brings automatic high-beam control, automatic on/off headlights, rain-sensing wipers, lane-departure warning, lane-keep assist, all-speed adaptive cruise control, auto-dimming mirrors, Homelink garage-door opener, and all-speed forward collision warning and mitigation. Grand Touring models can be ordered with Parchment-colored leather upholstery that helps project the upscale image Mazda is shooting for with the new CX-5. Springing for the $30,335 Grand Touring gets you most of the equipment in Touring’s option packages plus leather upholstery, 19-inch alloy wheels, 8-way power driver seat with power lumbar adjustment, satellite radio, heated mirrors, LED taillights and fog lights, and adaptive headlights. An $1830 Premium Package brings a head-up display, power front passenger seat, heated rear outboard seats, heated steering wheel, and windshield-wiper de-icer. With all the changes, a few elements remain. The only engine offered is the previous-gen model’s 2.5-liter four, now with 187 horsepower vs. 184. The CX-5 also maintains its console control knob augmented by a dashtop-mounted touchscreen for most infotainment-system adjustments. The powertrain comes off well. It provides a decent full-throttle jump off the line, while impressively quick kickdowns from the automatic transmission contribute to good passing response. We tested a top-line Grand Touring model, and it rode quite well on its 19-inch low-profile tires (the “low-profile” part sometimes making for a slightly rougher ride; other models get “taller” 17s), handled nicely, and was very quiet over bumps and on the highway. Like other Mazdas — and many other vehicles — the CX-5’s infotainment system is adjusted via a console control knob and protruding dash-top screen. Unlike some, the screen is touch-sensitive, but that function is deactivated when the vehicle is in motion. 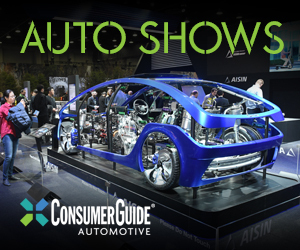 Consumer Guide® has never been a big fan of Mazda’s console-control-knob infotainment interface – or of similar systems used in many other makes – but it’s admittedly less cumbersome than some and even less so once you get used to it. Mazda’s system includes a touchscreen with some redundant controls (which many others do not), though it’s a bit of a stretch to reach, and it’s inactive when the car is moving. Our stance remains, however, that using a touchscreen is usually faster, which means less time with your eyes off the road. Climate controls include a rotary temperature knob but less-convenient repetitive-step pushbuttons for fan speed and mode, and though mounted a bit low, they’re easy to reach. Visibility is fair to the front and rear corners, decent to the sides. A rearview camera is standard, and at least the one in the top-line Grand Touring we tested displays a wide, 180-degree view on the 7-inch dashtop screen, which allows seeing both ways down a parking-lot aisle when backing out of a spot – something rather rare that we really appreciate. There’s great headroom and good legroom in front, and the seat in the Grand Touring seemed more coddling than most. Rear-seaters also have great headroom, and my 5’9 frame had plenty of legroom remaining even with the seat ahead pushed all the way back. Egress is eased by the taller ride height, and though the rear doors open fairly wide, the door frame may catch some hips on the way out. The Grand Touring offers a choice of black or “Parchment” leather upholstery, the latter joining with silver and woodgrain trim to add a nice bit of contrast to the interior. Mazda says it’s aiming upscale with the new CX-5, and that’s reflected in padded surfaces that include the dash top and face, door tops, armrests, and – unusually – the sides of the console (appreciated by the knees of long-legged drivers). Interior small-item storage ranks as about average for the class, maybe a bit above. There’s a decent-size glovebox and a good-size 2-tiered console box with SD-card slot, 12-volt plug, and 2 USB ports, along with a large forward-console bin with 12-volt plug, two console cupholders, and modest map pockets in the doors. Rear seat backs can be folded either by a lever on the seat back or ones in the cargo area — a handy touch — and they rest flat and level with the cargo floor. 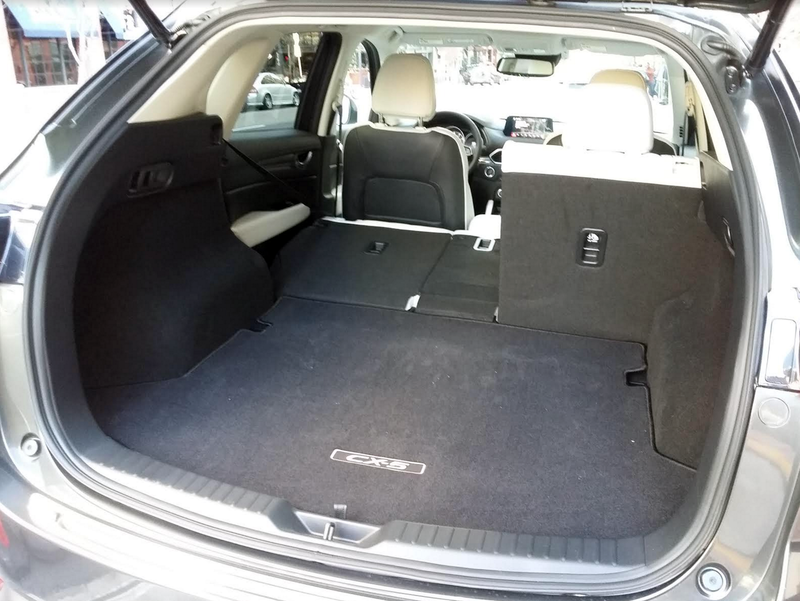 In back, the cargo area is wide at the rear, and the folded rear seat backs rest flat and level with the cargo floor (and have releases both on the seat back and in the cargo area – a nice touch), making it easy to slide long items forward. There was no extra storage under the floor in the tested Grand Touring, though models without the Bose sound system – and its included speaker in the center of the spare-tire rim – may be able to offer that “bowl” as informal stash space. There were no tie-down hooks we could find, but there was a handy 12-volt outlet. Consumer Guide® has long placed the Mazda CX-5 on its Compact-SUV Best Buy list for its fine road manners, practical packaging, and upscale feel. The 2017 version brings some added high-tech convenience and safety features, and expands the availability of many to lower-line models, something that was a bit of a sore spot before. As such, the 2017 is better than ever, and though rivals have improved as well, the CX-5 remains among the top contenders in a very competitive class. Mazda’s redesigned CX-5 offers a host of new features for 2017 that bring it thoroughly up to date with the best in the compact-crossover class, all while maintaining its admirable driving dynamics, practical utility, and strong value equation. Written by: Rick Cotta on March 13, 2017.